Once upon a time in Berrien County there were three Nash sisters named Ellie, Estell, and Bessie. Properly, they were Martha Elizabeth Nash, Frances Estell Nash, and Bessie Nash. They were daughters of Edward C. Nash and Susannah Hancock, and they grew up near Lenox, GA where where their father was a farmer. The Nashes and Hancocks were among pioneers of old Berrien, both families settling here even before the county was created in 1856. Later, when the girls were grown, Edward and Susannah Nash would move to near Ray City, GA.
Two of the Nash sisters married Luke brothers. The Lukes were also from an old Berrien family. Their grandfather, Samuel Young Luke, came to Berrien county prior to the Civil War. The Luke boys were sons of Lucretia C. “Cresie” Stone (1872-1937) and William Burton Luke. Their father was a Berrien county farmer and the boys were raised in the family home on Washington Street in Nashville, GA. Their father died in 1905 before the boys were in their teens. Thereafter the boys and their siblings were raised by their widowed mother. To support the family young Perry and Walt Luke worked as farm laborers, while their mother worked for wages as a seamstress. 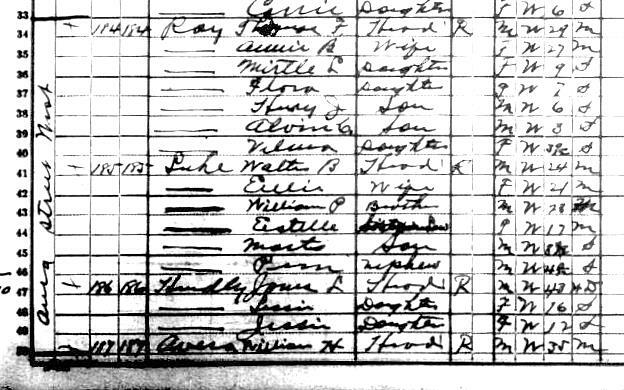 The boys appear in their mother’s household in the 1910 Census of Nashville, GA, but some time before 1917 Cresie Stone Luke moved her family to Lenox, GA. It was in the winter of 1917 that the eldest of the three Nash sisters, Ellie, married Walter B. “Walt” Luke. 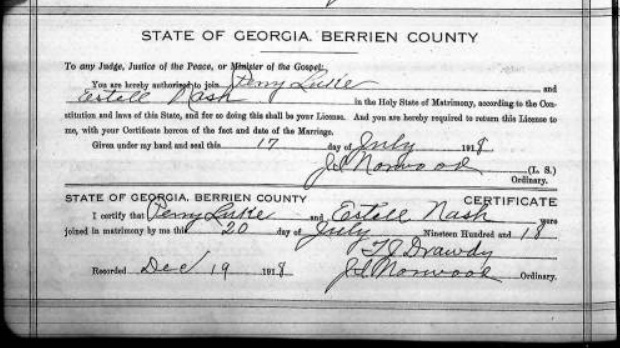 They were married December 18, 1917 in Berrien County, GA in a ceremony performed by D. J. Baldree, Notary Public and Ex Officio Justice of the Peace. The bride was nineteen years old. The groom was twenty-one, of medium height and build, with brown hair and brown eyes. He was working a farm as an employee of Newton Rowe. The following summer on July 20, 1918 the middle sister, Estell Nash, married William Perry Luke. They were married in Berrien County by T. J. Drawdy. Perry was tall with a medium build, grey eyes and dark brown hair. He was self employed in Lenox, GA. The third Nash girl, Bessie Nash, married Lonnie or Lannie Johnson. The Nashes didn’t know much about Lannie Johnson, not even the name of his father or mother. Just that he had come to Berrien County from Alabama, and he was twice Bessie’s age. Ellie and Estell Nash Luke, and their husbands, Walt and Perry, rented a house together on Avera Street North in Nashville, GA and set up housekeeping. The men both got jobs as laborers at the planing mill in Nashville. The women kept house and raised their babies together. After marriage, Bessie and Lonnie Johnson had moved to Daytona Beach, Florida. They would return to Ray City, GA in the summer of 1926. After her two eldest boys married, Cresie Luke first went to live with a younger son, James Oliver “Ollie” Luke, at New River, GA. By 1926, Cresie Luke moved from New River down to a home on the Ray City – Adel road near Ray City. Thus, the Lukes, the Nashes, and the Johnsons were all connected to Ray City in the summer of 1926.